St. Martin's Griffin, 9781250161727, 240pp. 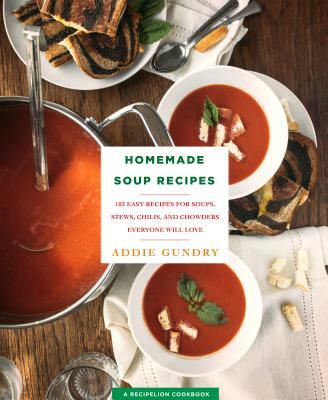 Cooking gets cozy with stovetop and slow cooker soups, stews, chilis, and chowders for the whole family to enjoy, in Cutthroat Kitchen star Addie Gundry's collection of homemade soup recipes. In Addie's home, the delightful sound of a simmering pot on the stovetop signals that a hearty soup or stew is on its way. When it comes to creating a cozy atmosphere and showing off your cooking chops, there’s nothing like an easy homemade soup recipe to bring family together. This cookbook has classics like Old-Fashioned Potato Soup and Beef Stew, as well as new culinary hits like Chicken Parmesan Soup and Pulled Pork Chili. Each recipe is paired with a gorgeous full-color, full-bleed finished dish photo.